Welcome to Smoothie Monday! Today’s smoothie really just blew my mind. I had the idea of the smoothie, but wasn’t sure how it would taste. So I did some experimenting and oh my gosh I created an amazing, healthy, refreshing smoothie that just makes me smile!! This my Friends is my Lemon Meringue Smoothie. 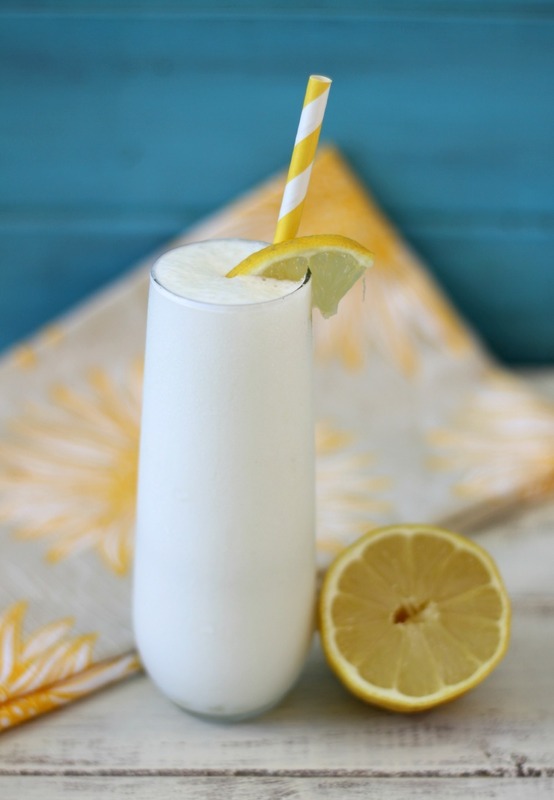 This smoothie is creamy, sweet, with a hint of coconut and a hint of lemon. It is truly a good morning smoothie that will make you smile and start your day off right!! 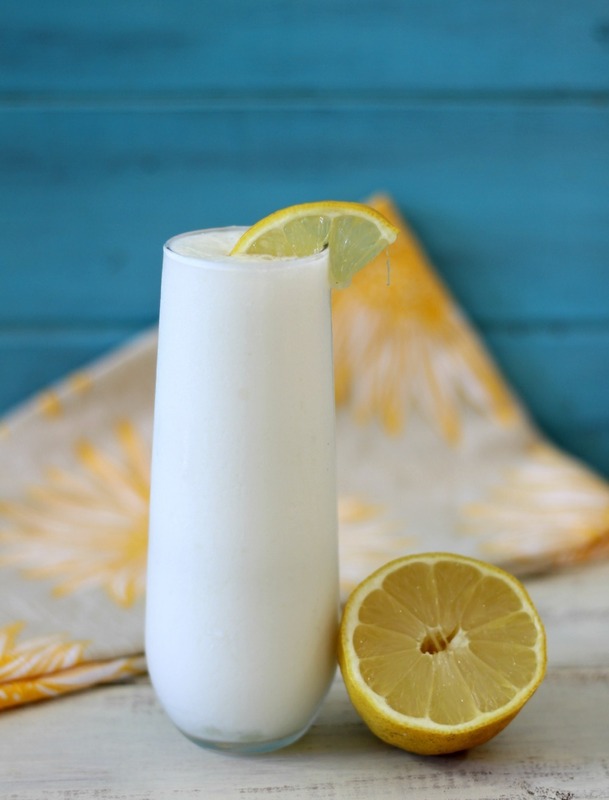 The smoothie is made with fresh lemon juice, coconut extract, greek yogurt and non-fat milk. Blend it away for pure creaminess. The smoothie is not at all sour or bitter!! I honestly was a little afraid of that happening. It has 20 grams of protein and only 17 carbs. The recipe makes for 2 cups!! I think this is the perfect on the go breakfast!! 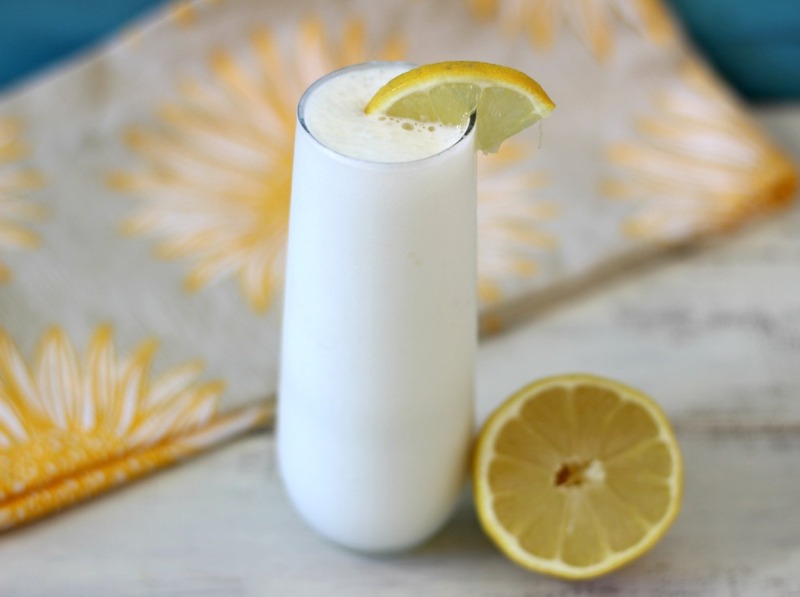 A healthy, creamy refreshing smoothie that tastes just like your drinking lemon meringue pie. In a blender add all the ingredients and process until smooth. 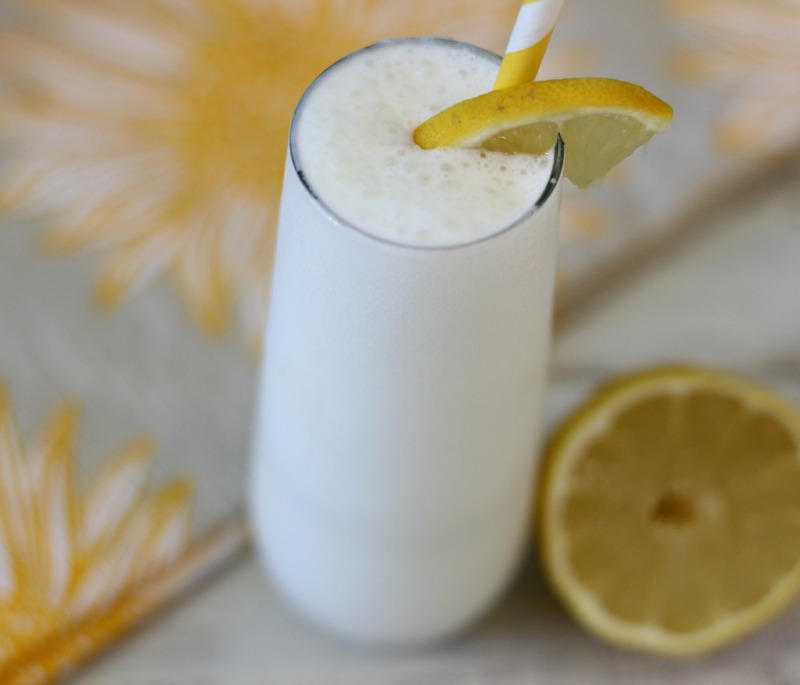 In California lemons are totally in season and nothing like using fresh lemons in a recipe. I have to admit, I have been on a little lemon kick lately. I just love how refreshing and healthy they are for you! Time to go, lots more blogging to do! Have a fantastic week! Remember to do something that will make you smile to today and in return make someone else smile! Thank you so much! I really do enjoy it! I love everything about this smoothie Jennifer. Such refreshing and delicious flavors you’ve got going on. As always, a great creation! Ahhh, thank you so much Chris! I have to admit this is one of my new favorites! Coconut milk would be great in this recipe! I would have used it, but I didn’t have any on hand. i made it, and it tastes FANTASTIC! Me and my brother had a great time drinking it together! I am so glad you like it! Thank you so much for letting me know. Love it! I substituted the coconut extract with 1/4 cup coconut milk, and used 1 tablespoon of organic light agave to sweeten, delicious! Yum! That sounds so good! I love the changes. It is a wonderful smoothie. Hi there Jennifer, I make my own Kefir Milk with live Kefir Grains. This is a type of yogurt but much higher with the probiotics. Anyone can just Google Kefir Milk and will be astounded at what it is and what it can do. 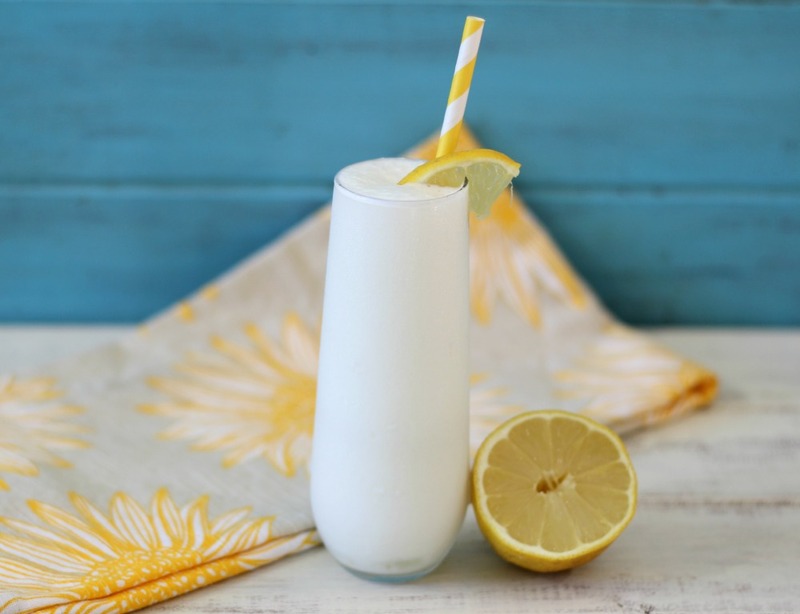 What I wanted to say is that I will make the Lemon Meringue Smoothie with my organic lemons growing in my garden and then use my Kefir Milk which tastes like Greek Yogurt. I will include the volume of the non fat milk so that it will be 1 1/2 cups of Kefir Milk in the smoothie.